I've been meaning to give Organic Energy a try since the first location opened in Solon what seems like years ago, but for some reason I've never been able to force myself to eat there. However, a few weeks ago, I happened to be in Chagrin Falls, hungry, with time to kill, so I decided to give Organic Energy a try. The menu listed a bounty of vegetarian options for me to choose from - including vegetarian soup and sandwich specials, so I hoped to have a great meal. 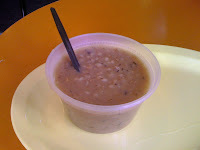 I ordered the mushroom barley soup, one of the specials of the day. It was incredibly good - not too mushroom-y, not too much barley, plus a little bit of spice. Good thing the soup was ridiculously hot and I couldn't scarf it down because it took forever for me to get my summertime pita, a sandwich that looked like a cross between a cheese-less quesadilla and a traditional pita bread sandwich. 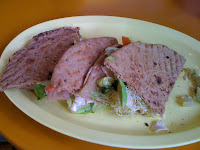 It was supposed to have avocado, tomato, tofu, onion, and cucumber with a cilantro lime dressing. I 86-d the onions and cucumber, and ended up with an un-flavorful, slimy non-marinated tofu-filled thing. It was not so great. Which was extra sad because the portion size was huge and I was hungry. 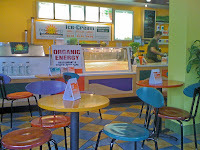 I'd definitely go back to Organic Energy for soup (takeout - I hate waiting forever for things like soup to be delivered to me in a restaurant or cafe) and maybe one of their famous smoothies, but if I'm in the mood for a sandwich, I'll hit Cosmic Dave's down the street.